You know Fall is here when you start seeing cute little Sugar Pumpkins or Pie Pumpkins in your grocery stores. Like their name suggests, they are sweeter than the big ones, which makes them ideal for pies, cakes, soups, and, for making homemade pumpkin puree! 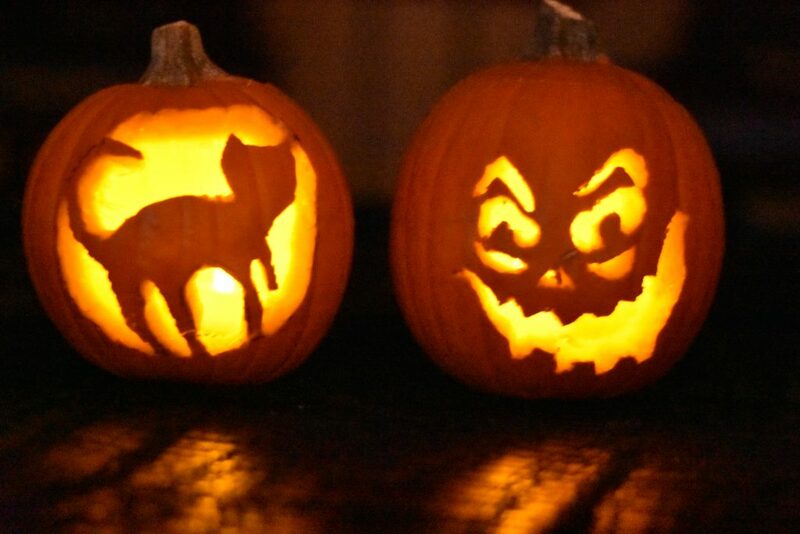 My kids love carving and decorating a bunch of sugar pumpkins for Halloween and putting them around the house with tea-lights. 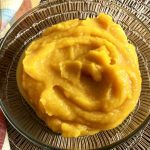 Till a few years ago, I used to think that making homemade pumpkin puree is a very time consuming process and was happy using canned pumpkin. Then, one day, my little girls went to a pumpkin patch with their school buddies and came home with a little too many pumpkins for us to carve and decorate. 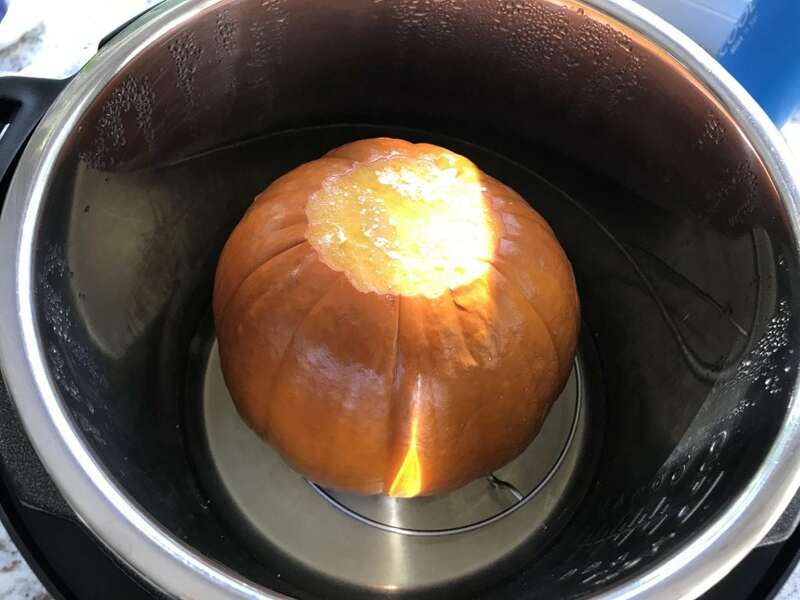 So, I looked up the recipe for oven-roasting the sugar pumpkin and made pumpkin puree from scratch for the first time. I’ve never looked at canned pumpkin puree again! Don’t get me wrong, I do value canned stuff, it makes life a lot easier. 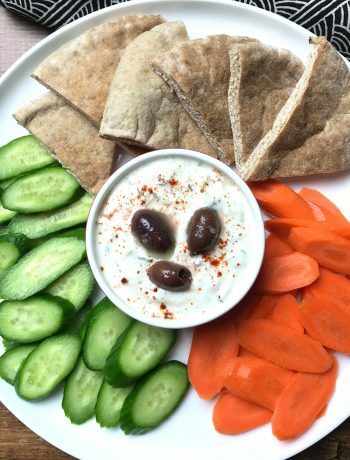 But, if you have 30 minutes- an hour to spare, most of which is not active cooking time, I would highly recommend giving either of these recipes a try. The taste is so much creamier and richer and that translates to whatever you end up making with it. 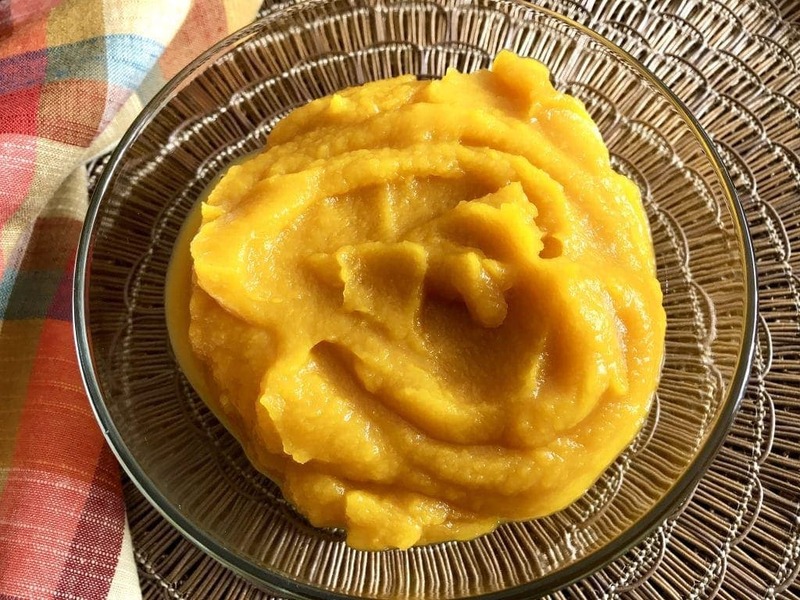 How to make Homemade Pumpkin Puree? 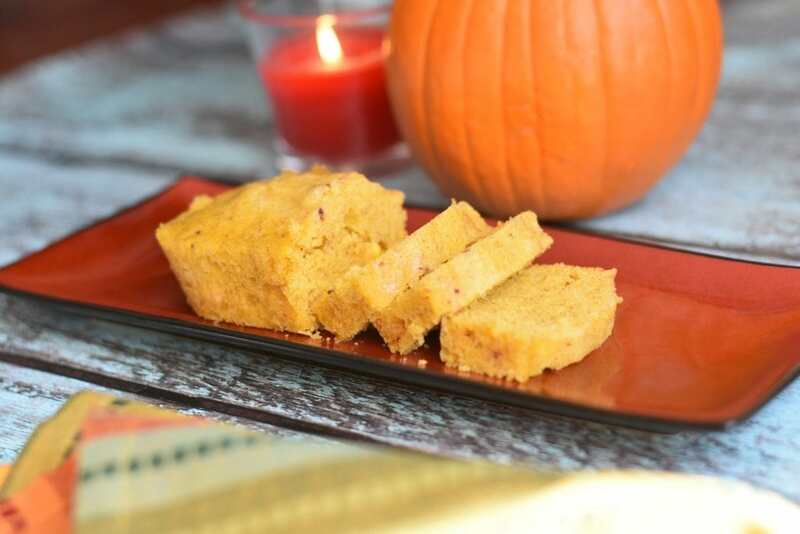 In my house, we end up using the puree in Pumpkin pie, Pumpkin Spice Walnut Bread, Pumpkin Spice Pancakes and our latest ‘food-venture’- Pumpkin Spice Cornbread! 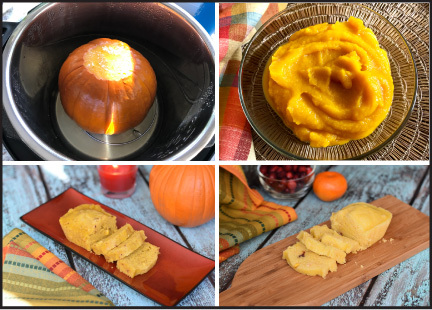 So, if you’re sold on the idea of homemade pumpkin puree, here are the two ways of cooking the pumpkin- roasting it in the oven, or, pressure cooking it in an electric pressure cooker like the Instant Pot. I like using smaller size sugar pumpkins for making puree, around 2 pounds each. A 2-pound pumpkin should result in roughly 2-2.5 cups of pumpkin puree. If you’re cooking 2 or more pumpkins, I would recommend using the oven method. I can easily fit 2 sugar pumpkins, around 2 pounds in size each, on one baking sheet. So between 3 racks, you can roast up to 6 pumpkins at the same time. If you do, remember to switch the top and bottom layer half way through. But if you’re cooking just one, Instant Pot is a clear winner- it cuts down the cooking time by a third. Pre-heat oven to 350F. Wash and dry the sugar pumpkin. Slice the stem off, it makes working the pumpkin much easier. Using a sharp knife like a chef’s knife, slice the pumpkin in half. Using a spoon or an ice cream scoop, remove the seeds and stringy core. You can save the seeds for roasting if you wish. Line a baking tray with parchment paper or foil. Place the pumpkin face down on the sheet (flat side down). Roast in the oven for 40-45 minutes, or till the pumpkin skin darkens and the flesh is fork tender. The exact time will depend on the size of pumpkin. Cool the pumpkin for 10 minutes. Using a large spoon, scoop out the flesh, like you would for an avocado. The skin is so soft and starts separating very easily from the flesh. Blend the pumpkin flesh in a puree and you’re done! Wash and dry the sugar pumpkin. Slice the stem off. Pour 1 cup water in the inner pot. Place the trivet and put the pumpkin on the trivet. Close the lid. Set the valve to Sealing mode. Press Manual, high, for 8 minutes. Let the pressure release naturally. Open lid, remove the pumpkin and let it cool for 10 minutes. Slice the pumpkin in half or quarters. 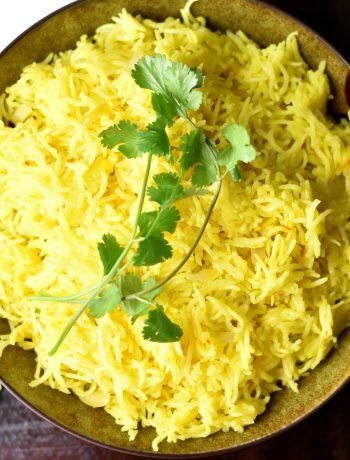 Using a spoon remove the seeds and stringy core. You can save the seeds for roasting if you wish. Using a sharp spoon, scoop out the flesh, like you would for an Avocado. The skin is so soft that it starts separating very easily from the flesh. Blend the pumpkin flesh in a blender and you’re done! ★ Did you make this recipe? Please give it a star rating below! 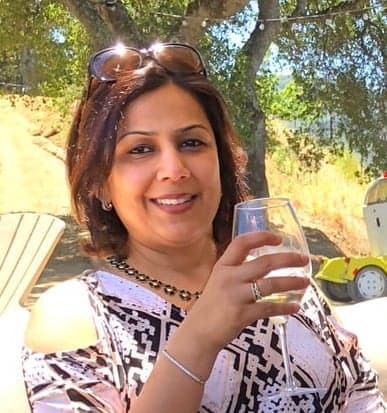 For more quick & easy recipes, FOLLOW ME on Facebook, Instagram, Pinterest and Youtube. 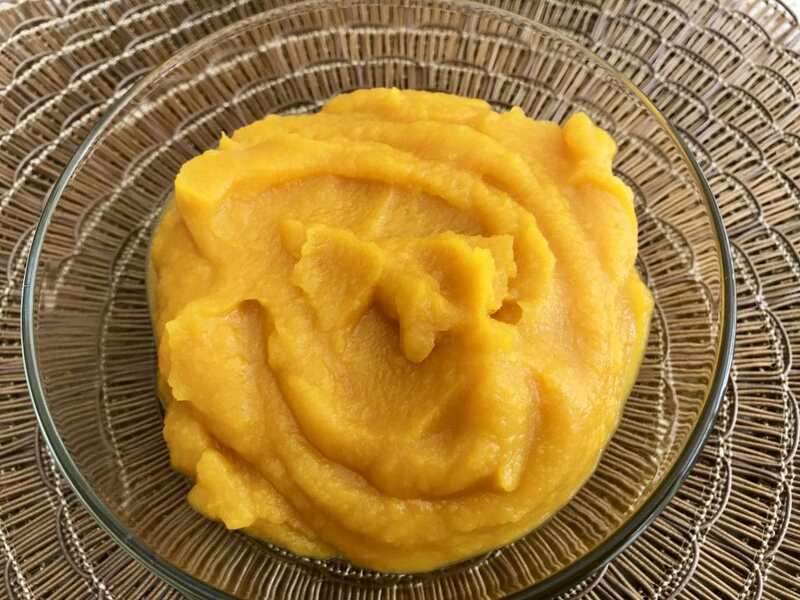 Homemade pumpkin puree takes minutes to make in an instant pot and takes your pumpkin-based pies and breads to the next level. You can use this pumpkin puree for making Pumpkin Spice Cornbread, Pumpkin pie, Pumpkin Spice Walnut Bread, and Pumpkin Spice Pancakes. Wash and dry the sugar pumpkin. Slice the stem off. Pour 1 cup water in the inner pot of the instant pot. Place the trivet and put the pumpkin on the trivet. Close the lid. Set the valve to Sealing mode. Press Manual, high, for 8 minutes.